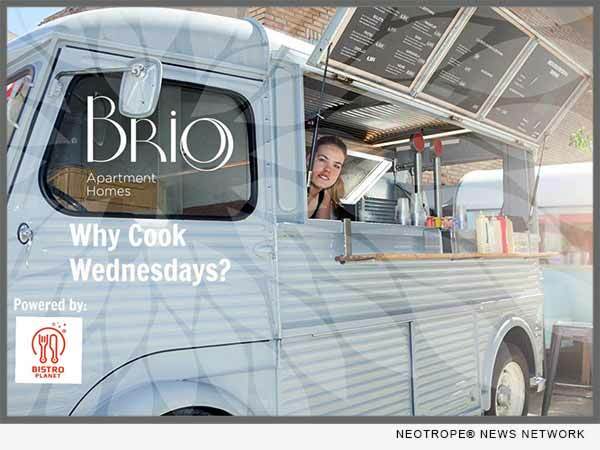 LOS ANGELES, Calif. /California Newswire/ — Bistro Planet, the first company to connect the entire food truck marketplace under one platform, announced today that they will be partnering with residential powerhouse, Sequoia Equities, Inc. to deliver an innovative weekly Food Truck Dinner Service for their residents at the Brio Apartments in Glendale, Calif. The pilot program will introduce “Why Cook Wednesdays” and give the residents the option of on-demand eating options in their apartment complex. Bistro Planet will work hand in hand with Sequoia to customize weekly gourmet food truck offerings based on data gathered through the use of the app including resident food preferences and average spend. Sequoia intends to expand the pilot program into other communities within their portfolio by the end of 2017. Under the program, Brio Apartment residents will be able to use the Bistro Planet app to view on-site food trucks, browse menus, order and pick up their meals quickly. “We are excited about the partnership with Bistro Planet and subsequent launch of the BRIO’s Why Cook Wednesdays Dinner Series. This new amenity is in line with our promise to elevate the everyday for our residents. Bistro Planet offers an easy value-add for customers who prefer to skip cooking in lieu of more family time. What could be better than multiple incredible restaurants coming to you with warm freshly prepared meals?” said Candace Appel, Brand Manager at Sequoia Equities. “Our partnership with Sequoia Equities is another great milestone for Bistro Planet. It’s been great to work with an innovative housing company that is creatively offering its residents the best of today’s experiences enabled by technology so residents have a seamless and fun experience. The app allows them to guarantee the food trucks are booked, the food is curated to the residents’ tastes, and that everything runs smoothly,” said Roie Edery, CEO of Bistro Planet. Based in Los Angeles, Bistro Planet connects foodies to food trucks in one mobile application. Using real time truck location technology users can discover trucks by cuisine type, distance, and personal favorites, browse the menus, order and pay online, and pick up when their food is ready. Gone are the days of waiting in long Food Truck lines. Here are the days of enjoying food truck food and the events where food trucks park. Sequoia is a real estate owner and investment manager. The company’s multifamily portfolio is approaching $4 billion and consists of market rate rental properties with a mix of garden-style and high-rise buildings. Sequoia specializes in a multitude of services, spanning acquisition to disposition, with core capabilities in asset management, renovation, repositioning, and property management. Over the past 30 years, Sequoia has become one of the largest privately-held organizations of its kind on the west coast; having acquired more than 15,000 apartment units with 49 assets currently under management. Property management services for these assets are provided through Sequoia’s 375+ employees.